Arrived Sunday afternoon after a 4 -1/2 hour drive from Trinidad, CO.
Tonight we rest and watch the Homeland season premiere. We’re planning the other 3 days that we’re here — so far it’s one night for dining (Beth, we need help here). Another day is Jan’s day to check out art galleries, and the last day may be a visit to an Anasazi site. After a 2 1/2-hour drive from Colorado Springs, CO, we arrived at Trinidad State Park in Trinidad, CO in the early afternoon on Friday. Driving through Trinidad was goofy-challenging as both of our GPS units (Rand McNally 7220 & iPad CoPilot) didn’t seem to have the latest road construction information. We decided to go with our eyes on this one. 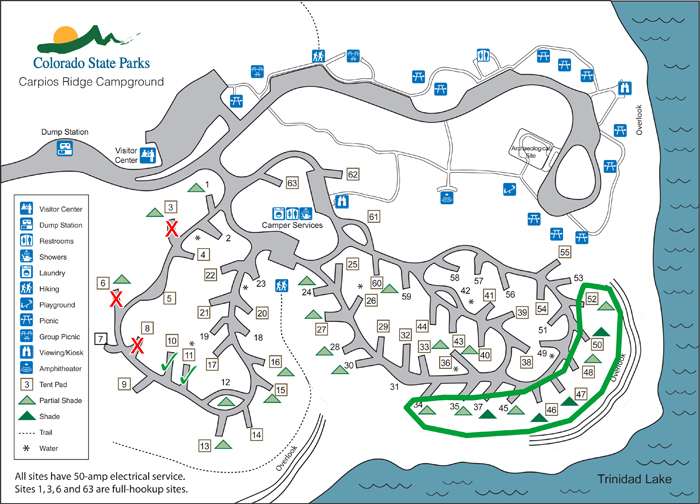 When we arrived at the campground, we discovered that the site we reserved (#3) was not level enough for us. What a shame since as we had to give up this full hookup site. We tried a couple of other sites (marked by red “X“s) and finally settled into Site #10. We marked a number of sites (#34 – 52) in green as these are the “prime” sites for great views. One of the park rangers told us that temperatures were going to drop into the 30’s over night so we turned on one of our heat pumps. Glad we did. Temperatures dropped to 31 degrees, but we were cozy. We are loving Colorado state parks. Here are some photos from Trinidad State Park . 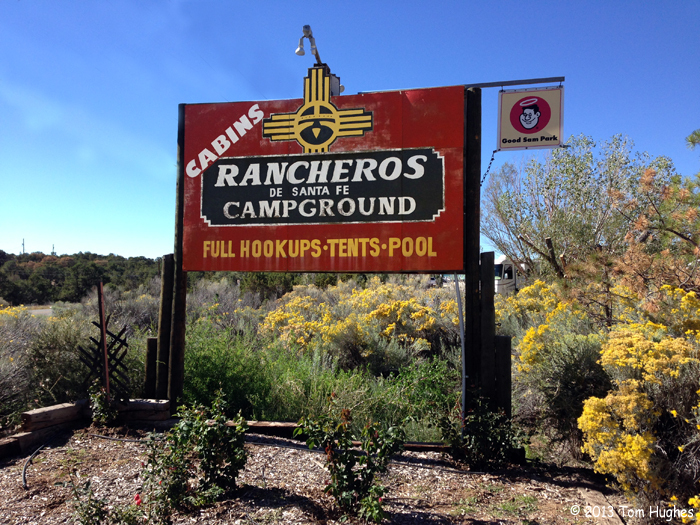 . .
NEXT STOP: Rancheros de Santa Fe Campground in Santa Fe, NM. We spent the afternoon in the Garden of the Gods Park, a national landmark near Colorado Springs. We’ll let the photos do the talking . . .
Mountaindale RV Resort is only 15 miles south of Cheyenne Mountain State Park so it was a short drive — great for a change of pace. We arrived about Noon on Friday and set up camp. There is a full-time RVer on one side of us and a retired couple from Aurora, CO on the other side. Lots of people here this weekend as Mountaindale is a short hop from Colorado Springs. There’s a small dog park on the campground which Flirt and Ellie love as they can run around off leash. Nice. Had an issue with our mail which was forwarded using the US Postal Service . . . long story short, whenever possible from now on we’re going to use Fedex or UPS. We’re here until Friday so we’re going to get out and about. Superb area! NEXT STOP: Trinidad Lake State Park near Trinidad, CO.
Made it. Our drive from Limon, CO to Colorado Springs, CO was uneventful except for a wrong turn in downtown Colorado Springs during Lunch Hour rush. My bad. We arrived at about 1 pm Mountain Time. Elevation = 6427 feet — we (and the dogs) are feeling it. The park is spectacular — hard to believe it’s “just” a state park as we have 50A full hookups, a concrete pad, a patio, and stellar views of Colorado Springs and Cheyenne Mountain.